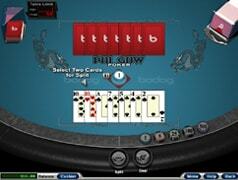 Pai Gow Poker strategy - how to win at online Pai Gow Poker. 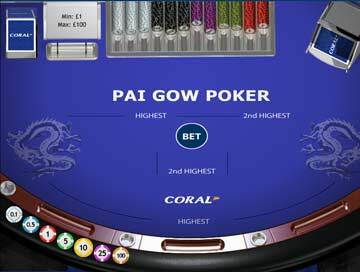 Pai Gow Poker offers something for every style of gambler - if you're a low, medium, or high stakes punter and whether or not you're experienced at Poker. 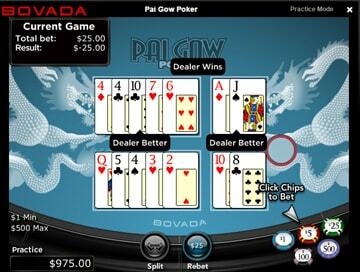 Below, we explain everything you need to know to become a winning Pai Gow Poker player. Check out our recommended strategies, then try them out risk-free by clicking on our free practice game (see foot of page). There's no catch - you can play for free, without downloading, and without registration! 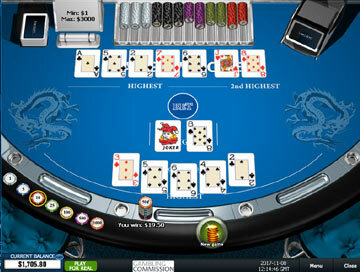 The temptation for players of Pai Gow poker is to see hands in straight poker terms. The secret to winning Pai Gow poker is in remembering that you have to win both hands in order to win the bet. set the two-card hand (front) as high as possible, whilst still leaving a higher five-card hand (back). If this isn't possible, and would leave you with two weak hands, set a 'stopper' or 'blocker' by setting the back hand as high as possible and leave a weak front hand. This won't win, but will hopefully stop the bank winning, giving you a chance to bet again. If your hand is just single cards (ie nothing - no pairs, straights, flushes) all you can do is set your 2nd and 3rd highest cards as the front. If you have a single pair, put the highest two single cards as your two-card hand e.g. if your hand is K,10,10,9,5,3,2, split them into K,9 and 10,10,5,3,2. This strategy will cover the majority of hands you'll be dealt and is a good way to get to grips with the basics of the game. 1. Two pairs of 6s or below - don't split. 2. The hand contains an ace - play the ace behind. Always play the highest pair in front. 1. If three Aces, play a pair of Aces behind and Ace high in front. 2. Otherwise, play the three of a kind behind and the remaining high cards in front. Set the back as whichever hand gives the better front. Set the three of a kind behind and the pair in front. Split the higher set into a pair and a single - play the pair in front and play the smaller 3-of-a-kind behind. For example, with K,K,K,10,10,10,5 you should play K,K and 10,10,10,K,5..
1. If 2 to 6, play it behind. 2. 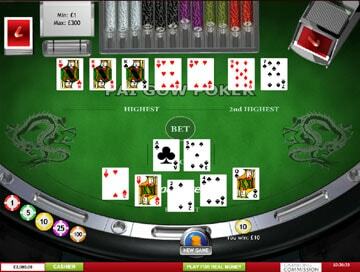 If 7 to 10, split into pairs, unless a pair or an ace and a face card can be played in front. 3. If J to K, split into pairs, unless the hand also contains a pair of 10s or higher. 4. 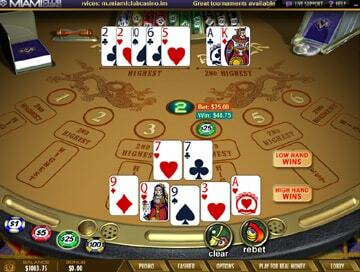 If Aces, split into pairs, unless a pair of 4s or higher can be played in front. 2. If Royal flush with two pair, split as per two pair rule. 3. 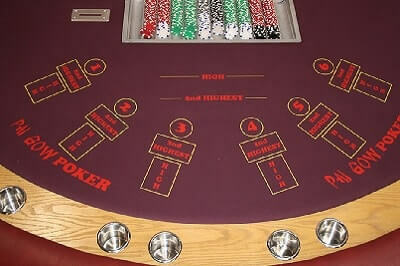 Split, if an A, K or a pair can be played in front and a straight or flush behind. Split, unless a pair of Ks can be played in front. Another important point is that some House Way buttons automatically play the hand once it's set. Others set the hand, but give you the option of whether to play it that way or not. This may not seem much, but it affects your overall strategy. 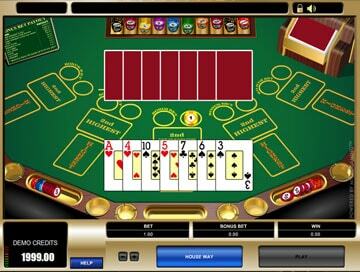 Playing Bonus or Fortune Pai Gow gives you the opportunity to stake an extra bet on the Bonus. 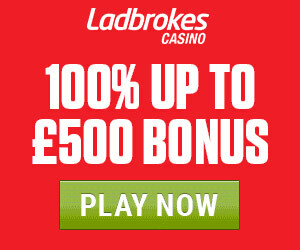 If you bet on the bonus, then you'll win up to 8000 times your stake if your seven cards contain a bonus hand (Straight or above). 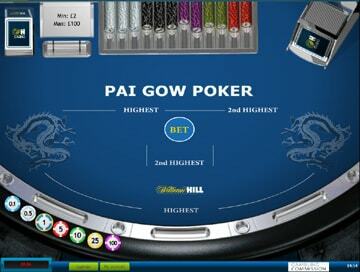 To see exactly how much you can win, check out our Pai Gow odds and payouts table. The payouts are big, but don't come anywhere near the odds against, so the house edge is substantial. This won't suit low and medium risk punters. However, if you're a high-roller, and prepared to take the risk, the Bonus bet adds enormously to the fun and excitement of Pai Gow Poker. It's the way we play! 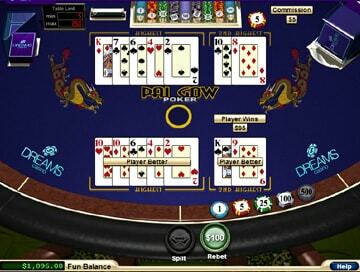 An explanation of the rules of Pai Gow Poker. In Pai Gow Poker, you're dealt seven cards which you have to make into two Poker hands - the Front (2 cards) and the Back (5 cards).